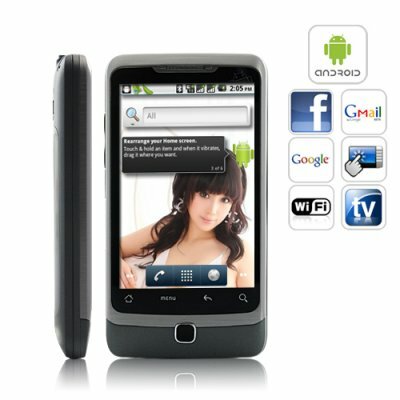 Successfully Added Xandron 3.5 Inch Android 2.2 Smart Phone (Dual SIM, WIFI, Touchscreen) to your Shopping Cart. Big screen, big functions, and big performance from the Xandron 3.5 Inch Android 2.2 Smart Phone. The Xandron Android Smart Phone uses the most currently stable version of the popular Android operation system available, 2.2 (also called Froyo) which is your key to the pre-installed Android Marketplace which in turn gives you access to hundreds of thousands of Android apps, many of them free. Do you use any of these products? Facebook, Twitter, Gmail, or Google Calendar just to mention a few. If your answer is yes then you'll love how Android 2.2 allows for seamless integration to these popular applications. The result: Your life is about to get a whole lot better in a bye bye Kansas type of way and you're like Android powered Dorothy! The fact is, since Android is a Google Mobile OS, expect it to sync wonderfully with all things Google. You remember the dark ages of info syncing don't you? Trying to sync your contact information with a special cable (that you almost always had to buy separately) or a cradle that was so darn cumbersome? And then there was the special software you had to use that was poorly written, took forever to load, and crashed a million times a day. Now let's take a look at contact syncing With Android 2.2 and the Xandron Android Smart Phone. Just enter you Google id and password, hit sync and all your Gmail contacts are automatically loaded into your phone. Update your Gmail contacts, and your phone contact list is updated as well. On top of being Earth's best mobile gmail client so you can get personal and work emails, contacts and calendars - all in one interface, The Xandron gives you complete access to Google maps, worldwide GSM connectivity (850 / 900 / 1800 / 1900 MHz), an amazing 2MP digital camera and camcorder, a tough to beat MP3/MP4 player that plays all the web's hottest audio and video file formats, and so much more. Handsome to behold, comfortable to hold, The Xandron Android Phone is like a breath of fresh air in a urbanscape littered with Android phone clones. Access live wallpapers for true customization, click, save, and upload photos and videos to all your popular social media accounts, the bottom line...you'll cross the finish line first with the Xandron Android Phone. Access 00000's of free apps, games, ringtones and more with the Android Marketplace! very pleased but it should come with memory card as it is necessary for the camera to work! otherwise, i am very happy with it. best mobile ive ever had ! exactly like HTC , i previously bought 2 mobiles of chinavasion , however the internet did not work , but in this one it is very fast & the market is great you can download anything. however if you are not great at working phones , this one takes a little time to get used to , but definitely worth it . on 2011-04-10 20:30:14 Price / quality ratio of this phone is very good. Try to find something better for the same money. As many functions can be seen only in expensive ayfon. A huge and bright display with a clear picture simply can not fail to please.